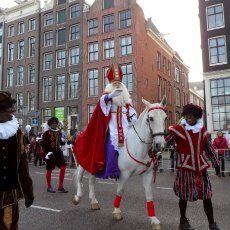 Sinterklaas (Saint Nicholas) is in Amsterdam! 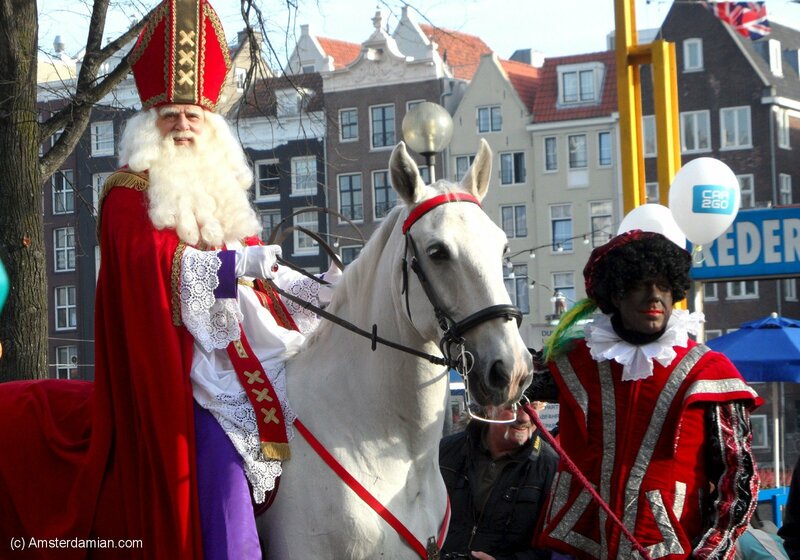 Today was an important day for Amsterdammers: Sinterklaas arrived to prepare the celebration on 5 December! 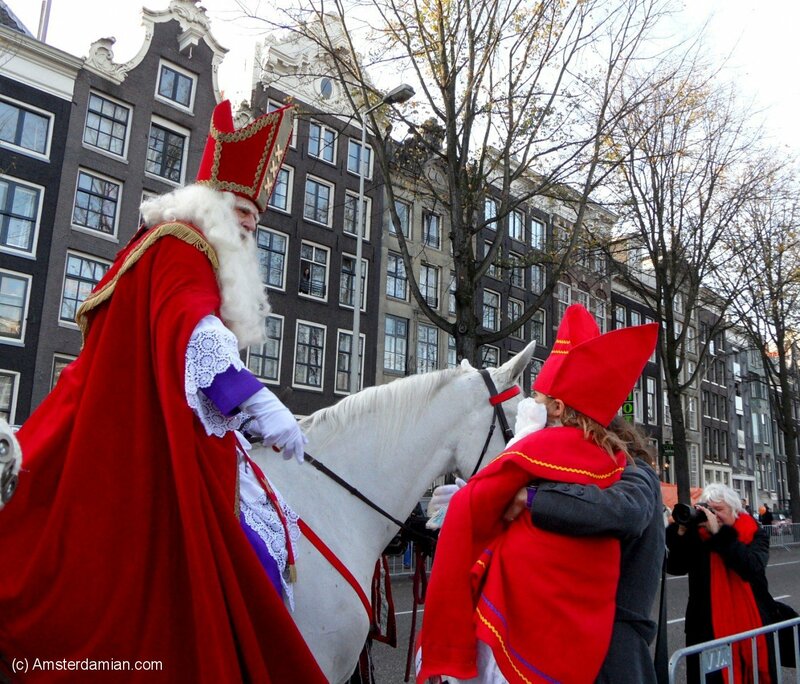 Every year, he leaves his home in Spain to arrive in Amsterdam and bring gifts to the children. 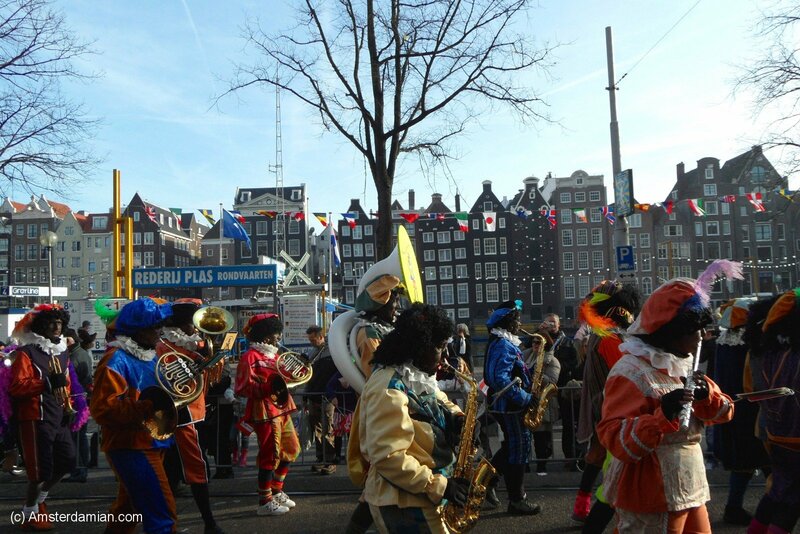 He is not alone, but accompanied by quite a few servants — the Zwarte Pieten (“Black Peters”); this year he brought with him a great number of them, a sign that there are many presents to be given. 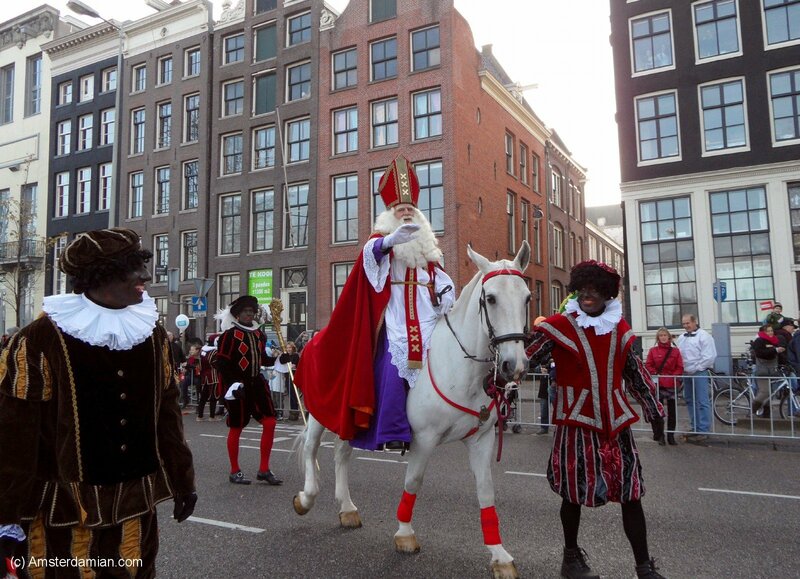 Sinterklaas is an important figure in Dutch tradition, based on a Catholic Saint called Nicholas who was a Greek bishop in the third century. Known as an honourable man who was kind to children, legend says he helped the ones in need by leaving some money in their shoes during the night. 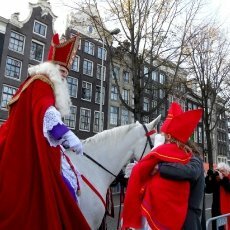 Saint Nicholas is not only the patron saint of children, sailors, travelers and young unmarried women, but also of the city of Amsterdam itself, and he was celebrated in the region since the Middle Ages. 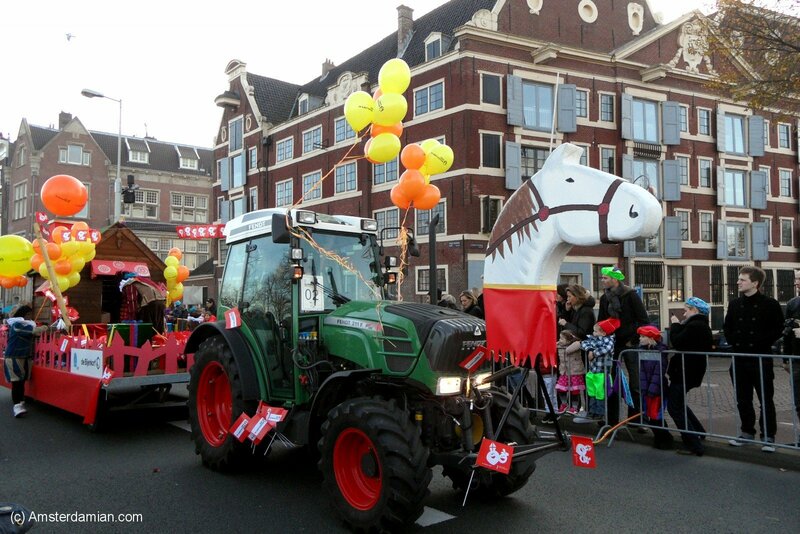 Nowadays, Sinterklaas arrives in the Netherlands each year in mid-November by steamboat from Spain. 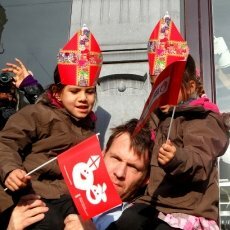 Exactly why he lives in Spain is not really known, but theories abound. 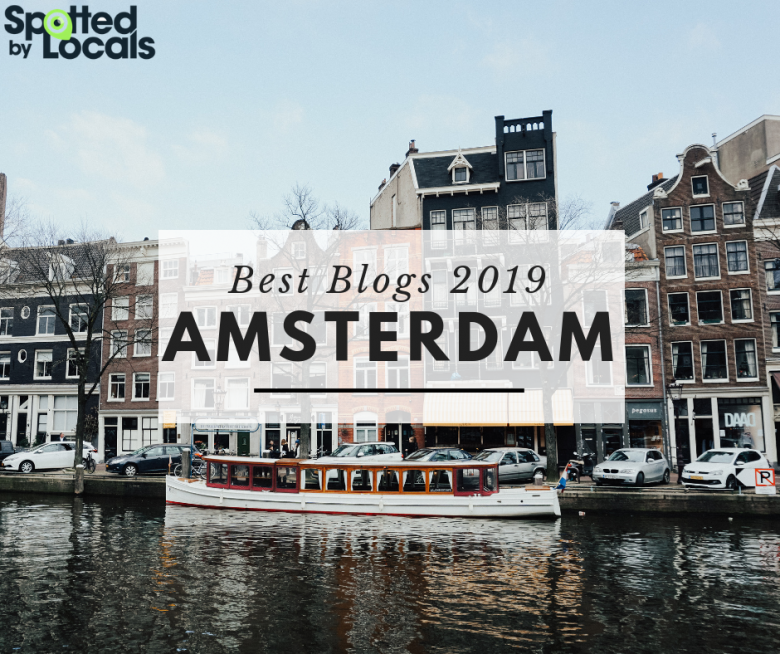 The stemboat stops in Amsterdam at the Maritime Museum and, after disembarking, he rides his loyal white horse called Amerigo on a walk through the city. 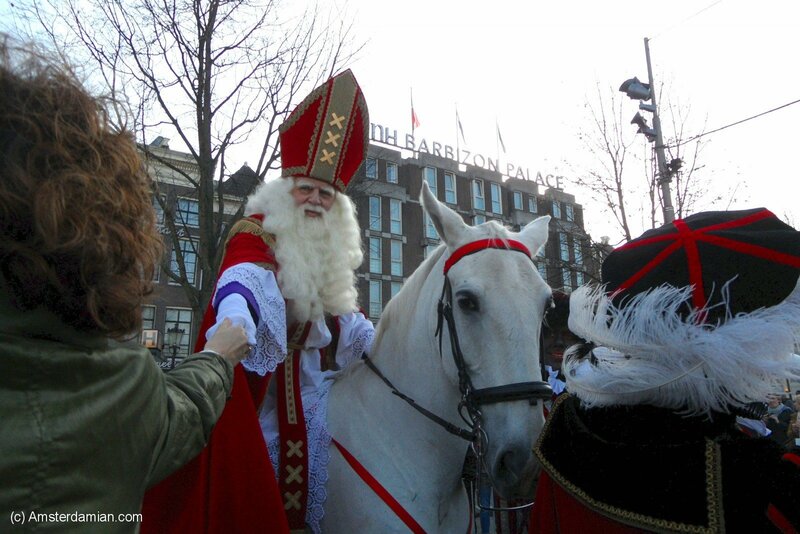 Sinterklaas is an elderly, serious man with white hair and a long, white beard. 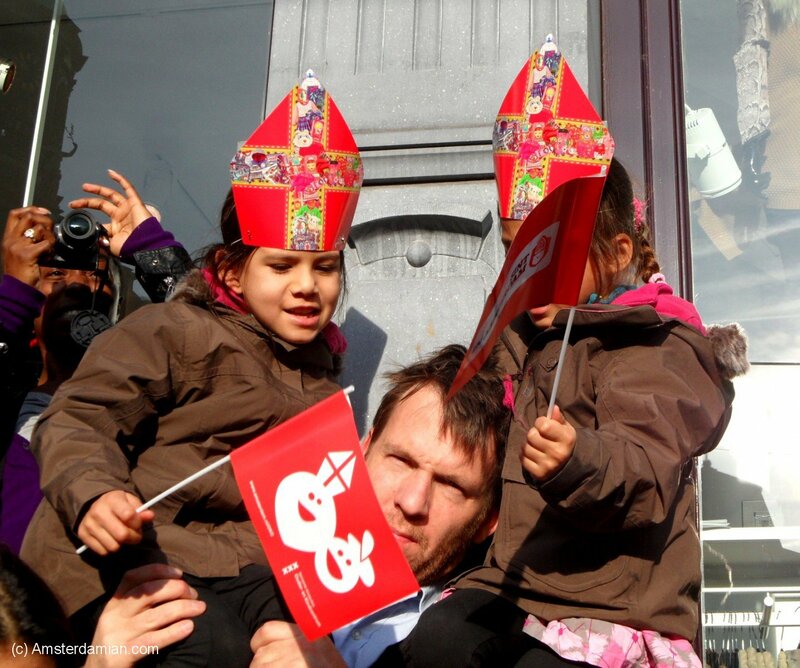 He wears a long red cape over traditional white bishop’s clothes and holds a gold-coloured crosier, a long ceremonial shepherd’s staff with a fancy curled top. 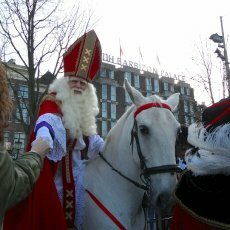 He carries a large book with detailed information about all the children and whether each one has been good or naughty during the past year. 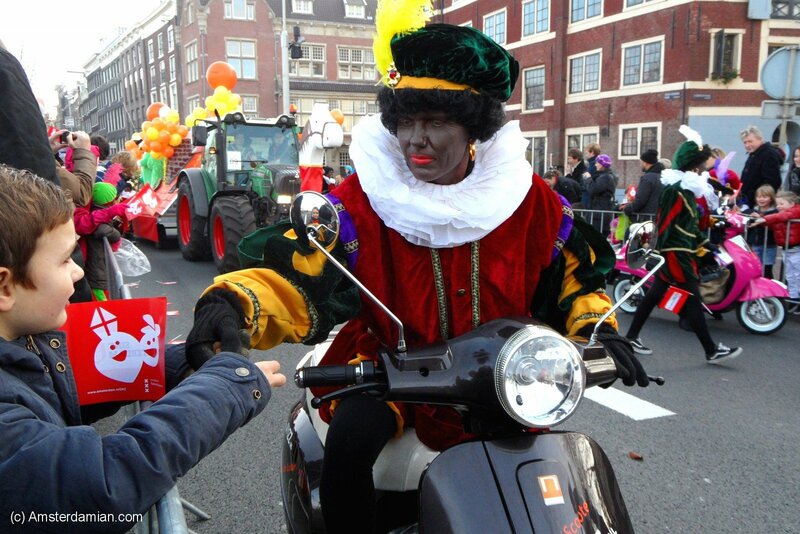 His helpers, the Zwarte Pieten are wearing colourful 17-th century costumes, have their faces painted black (allegedly from climbing down chimneys) and they spread pepernoten (spicy Dutch biscuits) to all the good children. They also carry a large bag for taking the naughty children back to Spain (I wonder why this would be considered a bad thing? 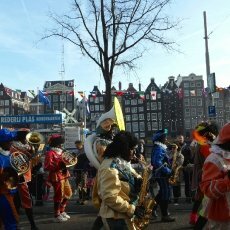 Probably the roots of this custom are very old, otherwise these days children would surely not be scared any more of this scenario; especially given the weather in Amsterdam compared to sunny Spain). 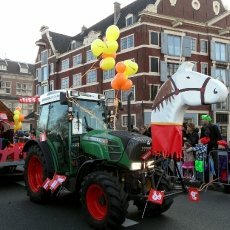 Until the big day of 5 December, called “Sinterklaasavond” (Sinterklaas evening) or “Pakjesavond” (presents evening), when the gifts are delivered, Sinterklaas will make his appearance on streets, schools and hospitals around the country. 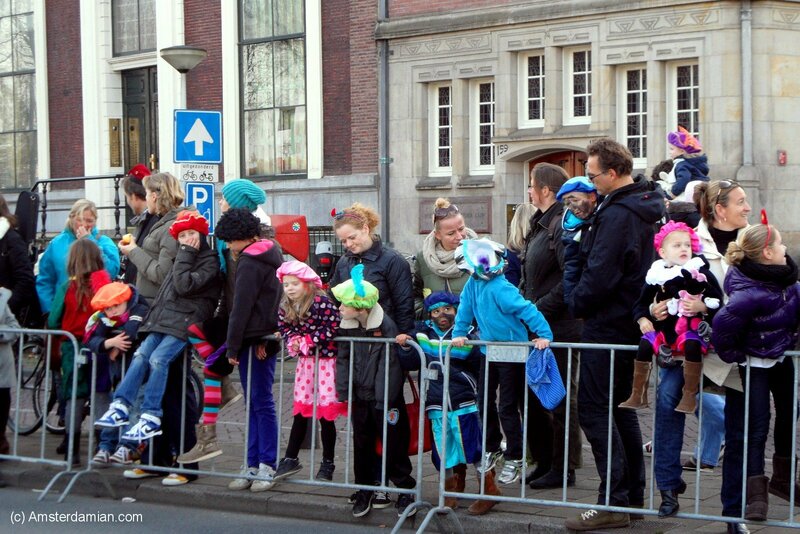 Meanwhile, children prepare their shoes and a big sock near the chimney, waiting to be filled with candy, fruit or iPods depending on their age… After sharing his generous gifts, on 6 December Sinterklaas will leave the country and return to Spain in order to prepare for the following year. 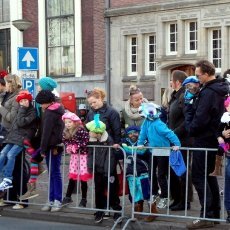 With such a huge celebration, there is not much left for Christmas, when the Dutch place less emphasis on gift-giving and more on a peaceful family dinner. 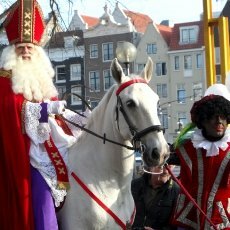 Actually, it is funny to note that the all-American “Santa Claus” is nothing more than a rebranded Sinterklaas, coming back to Europe after going full-circle over the Atlantic; the wonders of a colonial empire! 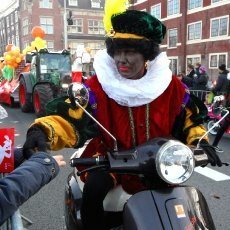 Hi, when will sinterklaas intocht 2012 be in holland?